Simply put, yes; heavier is better because the heavier the base, the stronger it is! 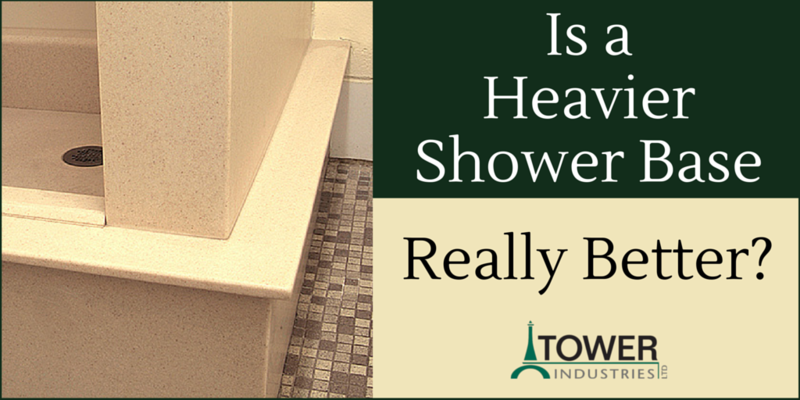 Why is a heavier solid surface shower base better for your project? A solid surface base has a multitude of benefits, including the highly important aspect of durability. Because solid surface shower bases are a solid piece of material, the resulting product is thick and strong, and, therefore, heavier. This heavy strength allows solid surface bases to withstand years of use. In other words, a solid surface shower base is built tough and made to last. In fact, we sent one of our solid surface shower bases to be tested to load capacity and they turned off the machine! Additional benefits of solid surface showers are endless. Solid surface is offered in a plethora of colors and textures, as well as standard or custom shapes and sizes. The product is highly resistant to heat, water, and bacteria, making it extremely easy to clean. Plus, if any scratches happen to appear on the material, they can be easily sanded away. Solid surface is cost effective due to long-term savings achieved in virtually non-existent maintenance costs. Plus, if special shapes, sizes, colors, or features are needed, such as a walk-in or roll-in entry, solid surface shower bases can be completely customizable. Ultimately, if you are involved in a project that requires a quality end-result, selecting a durable, heavier solid surface shower base is the best choice you can make. Solid surface showers offer endless benefits to help you accomplish a successful bathroom project.